Welcome to the first review of 2017! 2016 saw a lot of great big cube releases across the board. 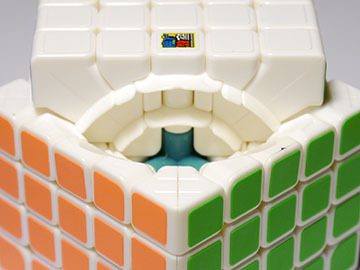 We'll finally take a look at the first new 7x7, the budget-oriented MoFang JiaoShi 7x7. 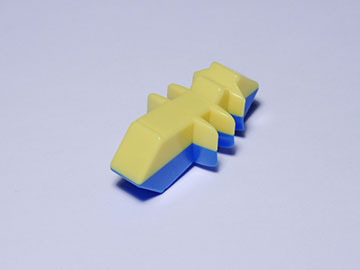 There have actually been two more released since then, the flagships QiYi WuJi and YuXin HuangLong 7x7. I haven't had a chance to take a look at them yet, but they're on the way. We'll see how the budget offering stacks up first! It's been a while since the Cubic AoFu GT was released, and during its entire time on the market it's been the undisputed leader of the pack. It was the main of every 7x7 speedsolver; comparable options just didn't exist. 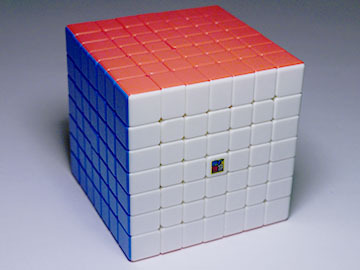 Its quality came at a high price though: retail price is $50, out of the price range of many cubers. 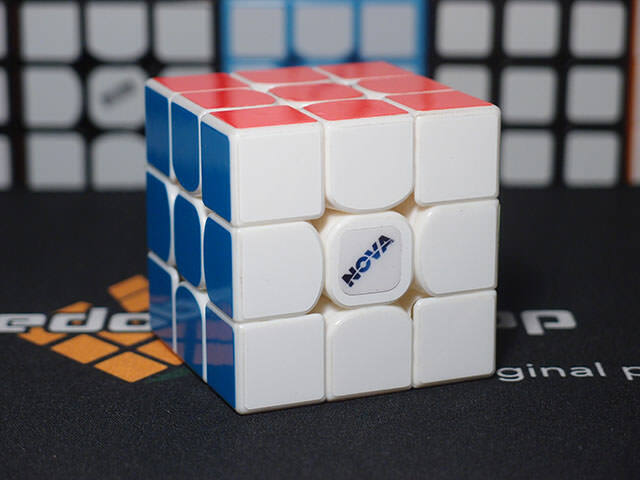 The ShengShou Mini 7x7 was a great option for a beginner or someone not looking to take 7x7 seriously, and sold at a much lower $35, but it just wasn't quite as good. That meant that you either had to cough up the $50 for an AoFu GT or resign yourself to not being able to speedsolve 7x7x7 to your full potential. 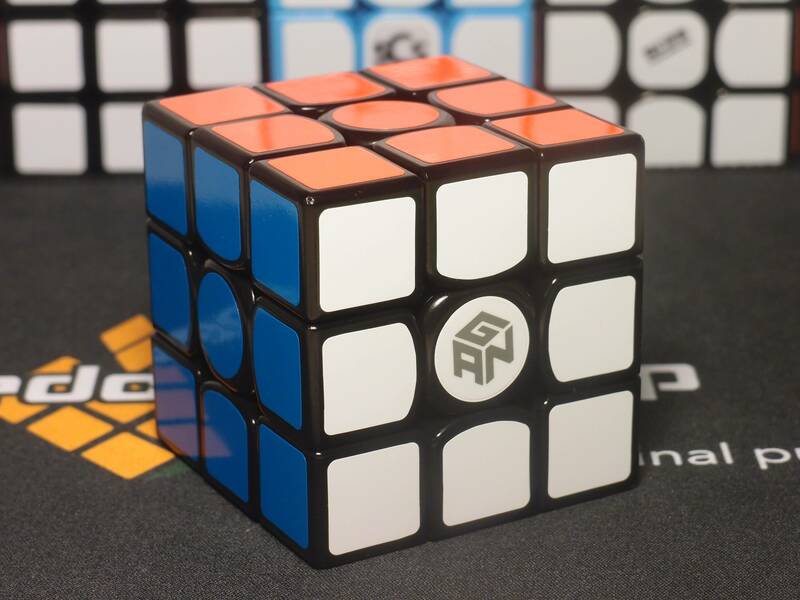 The MF7s is the first "high performance" 7x7 released since the AoFu GT, but with a new priority in mind: it wants to capture that awkward section of the market previously held by the ShengShou Mini 7x7. It's smaller and cheaper, but despite its impressive price point it aims to perform as well as the flagships, giving a better value to everyone. This puzzle actually looks and feels quite a lot like the AoFu GT, with its relatively flat and flush pieces. 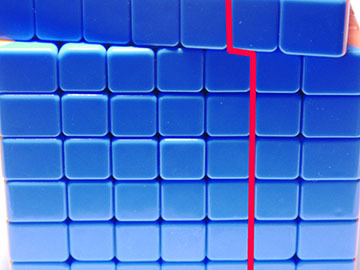 The puzzle measures 69mm, 1.5 millimeters down from the AoFu GT's 71.5mm width. It also weighs 235 grams, 13 grams down from the AoFu GT's 248. For some reason in the hand it feels more solid than the AoFu GT, which is good considering budget cubes tend to go the other way. For some reason the center cap doesn't quite sit flush with the rest of the pieces, sticking a fraction of a millimeter above the face. This is probably because the center caps are hitting the center screws, which is a bit of a beginner mistake if I'm honest - however, it's not a dealbreaker for me, and if it is for you, you are able to file the flange down. We'll be taking a look at the stickerless version today, which comes with standard bright Moyu stickerless shades. 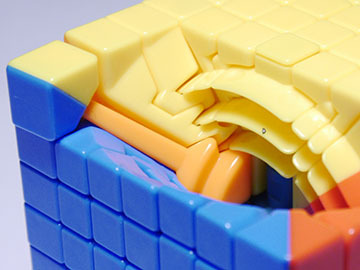 Everything is very bright and vibrant, and the cube looks quite attractive overall. The stickered version should come with MoYu stickered shades as well, though I can't tell you if they're the higher quality or lower quality variant. Out of the box the cube was already smooth and stable, and I didn't want to mess with the feel too much. Instead, all I did was lubricate the inner layers with a good amount of weight 6, and have done 50 solves on it since. Well this was surprising. This cube costs just 58% of the AoFu GT, after all. 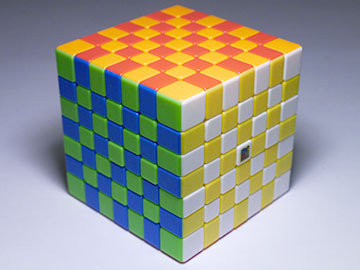 The turning on this puzzle is impressively smooth, easily the smoothest 7x7 I have felt to date. It's slightly rolly, as if there were tiny ball bearings each layer was gliding on, but overall it's much smoother than the Aofu GT and almost as smooth as the WeiShi GTS. It's more stable as well. At stock tensions it's nowhere near as flexy as the AoFu GT, and layers that you are not trying to move maintain their shape well. I often find that during the 3x3 stage on the AoFu GT turning the outer layers sometimes leads to the second outer layer being carried a bit as well, which then leads to a lockup on the next turn. This still happens with the MF7S, but not nearly as often. There is a downside, and while I'm not bothered by it personally some people might be. Being more flexible and unstable, I find the AoFu GT conforms to your grip slightly better, manages high speed better, and overall just subjectively feels a bit more like a speedcube. The MF7S, while not bad in this sense, is much more blocky and requires more precise turning, all while (subjectively) feeling slightly more like a casual cube. 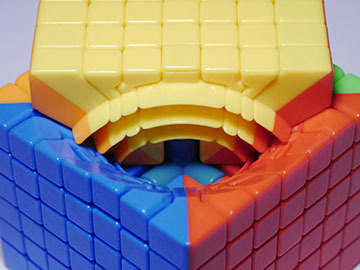 As with most other big cubes, the outer layers are the best corner cutting layers, managing about one and a quarter cubies forward and half a cubie reverse. Luckily, the MF7S' corner cutting feels much smoother and snappier and less crunchy as the AoFu GT's does. Inner layers pretty much all forward cut one full cubie. 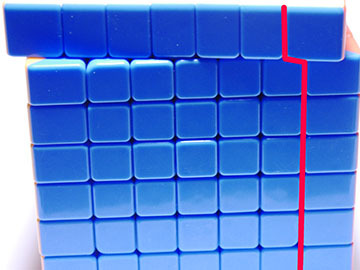 Impressively, certain inner layers can reverse cut half a cubie, though not all. 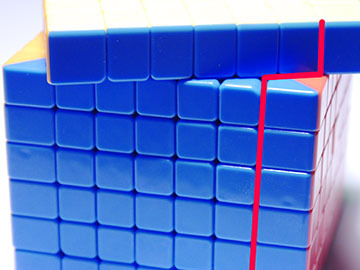 We don't have too many 7x7s out to judge that performance on, but going just by the AoFu GT corner cutting on this cube is right up there among the top dogs. I'll have to wait for the WuJi and the HuangLong to see if that changes. Pops don't happen. That one issue with the MF5S where you could easily pull out a tredge is gone as well. Lockups are rare simply because of its blockiness and stability, and in fact I'd say the AoFu GT locks up more. Indeed, the results of the AoFu GT's lockups are much worse. I've had centers get jammed in a wrong face or even pop out entirely, whereas on the MF7S even the worst lockup can be fixed by pushing a few centers back into place and reversing the turn. I was not looking forward to this part, let me tell you. A 7x7 consists of 218 external pieces alone, and my disassembly attempt was...er...not that successful. Thankfully, I managed to recover all of the 40 or 50 pieces strewn across my room, and reassembled it to this sight. The rings make for pretty unique looking edge pieces. The corner piece - 2 layers of locking feet and an excessively long stalk. It's unified, which is what I like to see. It's actually a very similar design to the AoFu GT, though with different dimensions. This is about the most similar piece, though. 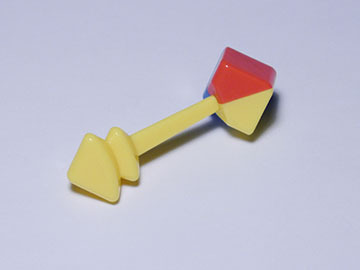 If we look at how the pieces go together, every successive layer from the center extends one ring deeper. There's probably some advantage to this, though that's above my head. However, it does serve to prevent pops quite well. Pretty unique design compared to the AoFu, though we've seen something similar with the MF5S. Evidently it's working quite well. I only have the AoFu GT to compare its turning and performance with, and in nearly every aspect this cube stacks up perfectly. It feels even smoother and corner cuts just as well, with even fewer lockups and no pops to speak of. 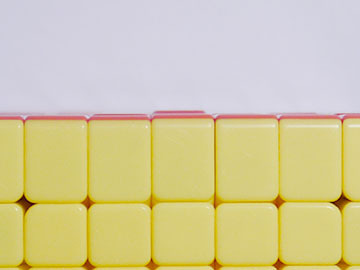 The only disadvantage is the blockier, less flexible feel, which may decrease turning fluidity. I love this 7x7, and it's taken over as my main from my AoFu GT. I adore the smooth turning and the stability, and really have no reason to go back to the 3 year old AoFu. I don't think the MF7S is just a different, more budget oriented offering than the AoFu GT. I think this it's actually an improvement. 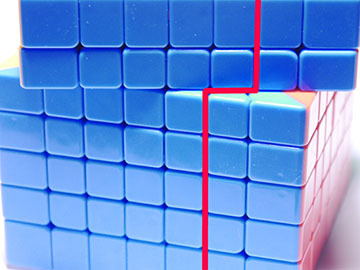 It may very well be that the AoFu GT is just too old at this point and nearly anything MoYu could come out with is much better, even a budget cube. In any case, the MF7S is an excellent 7x7 and the favorite I have ever used up to this point. 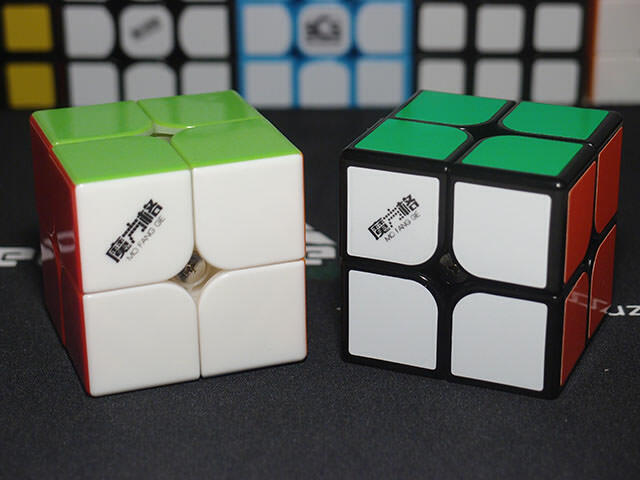 It's also the most affordable ever, retailing at just $28.95 and undercutting even the ShengShou Mini 7x7. 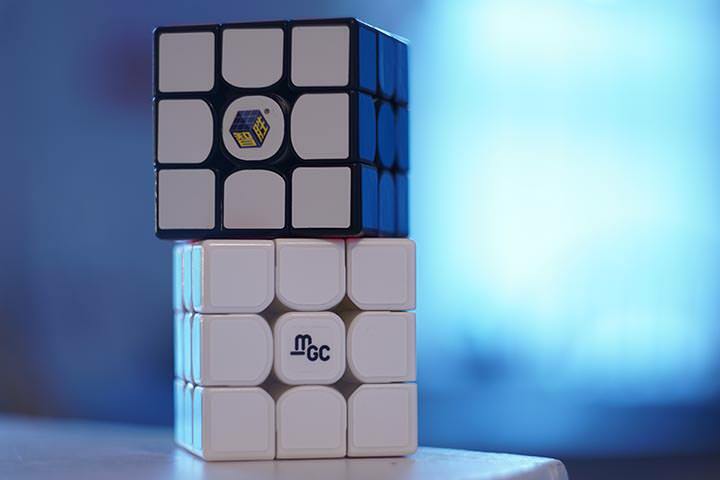 With this cube, not only has the state of 7x7 hardware been pushed forward, the price point of entry has been lowered and more people than ever have a chance to buy a great 7x7.